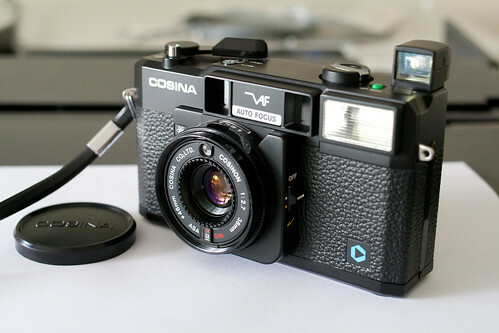 The Cosina AF-35 is a compact camera for 35 mm film, introduced by Cosina in 1979. It belongs to the first generation of autofocus compact cameras and uses the Visitronic autofocus system by Honeywell, like the Konica C35 AF or Flash Fujica AF, but unlike the two latter the AF can be switched off and zone focusing can be used instead. Another noticeable detail is the pop-up viewfinder. 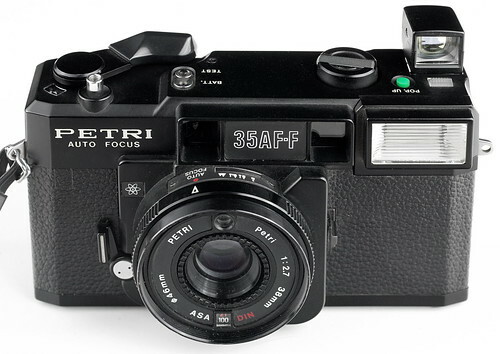 The camera was also sold by Petri, labeled as Petri 35AF-F. Exposure meter CdS-Cell inside the filter thread, metering range at ISO 100 from 9 EV (f/2.7 and 1/64 s) to 17 EV (f/19 and 1/360 s). Exposure lock via half-pressed shutter button. Viewfinder Pop-up viewfinder, Albada type (bright frame), AF-mark, parallax marks, underexposure warning (red light). The flash-ready indicator on the top plate is observable through the viewfinder. Built-in flash Guide Number 14 at ISO 100. Has to be switched on and off manually, with signal lamp for flash charge. Flash is switched off automatically when the viewfinder is retracted.